Cambridge, MA – A R E A presents LIFE LINES, a new body of work by Emily Lombardo that weaves a personal and cultural examination of lesbian lineage. The artist approaches this study as a genealogist who is piecing together the stories of her lesbian family, which are fading from cultural memory. 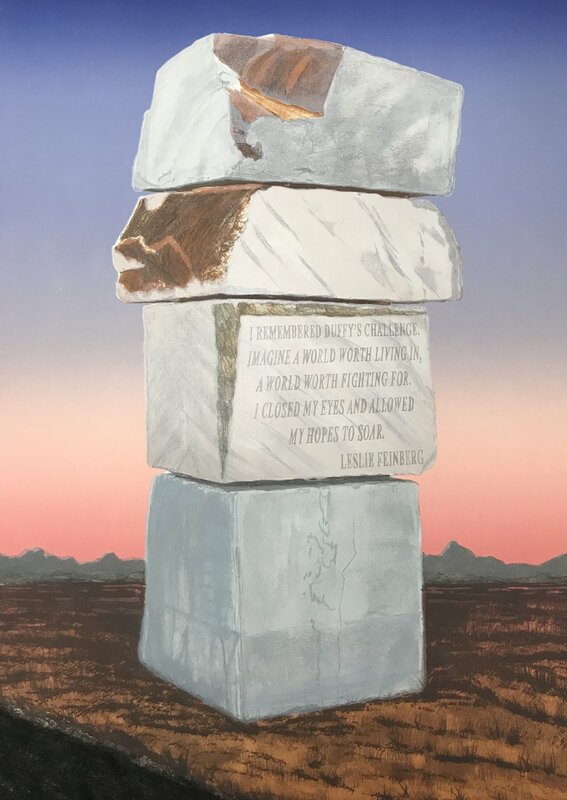 Lombardo conjures surreal images of struggle and strength, which stretch across time to consider where we stand today. LIFE LINES is honoring the artists, fighters, and community that struggled for civil rights and helped her to find her voice. The public is encouraged to take rubbings from Lombardo’s woodblocks to create their own piece of visual history. The size and structure of A R E A (Cambridge) lends itself to being reimagined as an early American Lesbian bar or Womyn’s Space. These places were a center for community where women could find lovers, form friendships, and create deep connective meaning in their lives. Lombardo and A R E A hope to continue that tradition by hosting open mic nights and readings during the term of the exhibition. Emily Lombardo received her BFA from The Massachusetts College of Art and Design and her MFA from the School of the Museum of Fine Arts at Tufts. Her work is in the collection of the Museum of Fine Arts in Boston, The Boston Public Library and The Meade Museum at Amherst College, among others. Lombardo applies her vast knowledge of print and sculpture across a wide range of conceptual projects. She engages with appropriative art practices as a mode of investigating personal and cultural identity. Lombardo’s first solo museum show, The Caprichos: Goya and Lombardo, is opening at The Academy Art Museum in Maryland this November. She currently lives and works in Brooklyn, NY.